Dark, smelly, filthy and crawling with rats – while this may be an accurate description of many subway stations and tunnels around the world, it definitely doesn’t apply to Barcelona’s Drassanes Station, Stockholm’s Tunnelbana, the Munich U-Bahn or 11 other bold, colorful, modern and just plain beautiful stations. Travelers taking these trains can catch a glimpse of a stunning abandoned station in New York, an ancient river under Athens, a nuclear bunker in North Korea and much more. 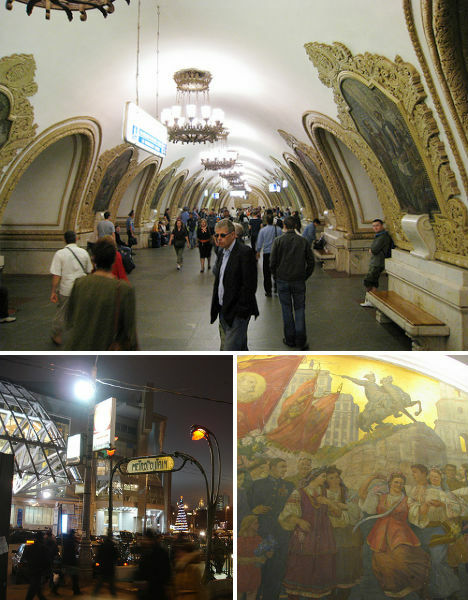 No subway station in the world is quite as elaborate as the ornate Kievskaya, a Moscow Metro station in the Dorogomilovo District. The design, which incorporates marble, decorative chandeliers, gold leafing, scrolled details, mosaics and frescos was chosen in an open competition and built in 1954. The mosaics celebrate the unity between Russia and Ukraine. Bright and open with a futuristic feel, the new look of Barcelona’s Drassanes Station is dramatically different from the dark, aging 1968 infrastructure. Reinvented by ON-A Arquitectura, the station features lightweight white glass-reinforced concrete coverings that were placed right on top of the old surfaces. 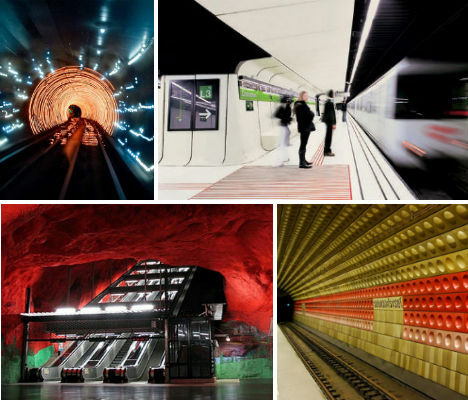 Stockholm’s incredible metro tunnels feature stations that make the raw bedrock a bold architectural feature instead of covering it up with artificial surfaces, giving them the feel of a natural system of subterranean caverns. 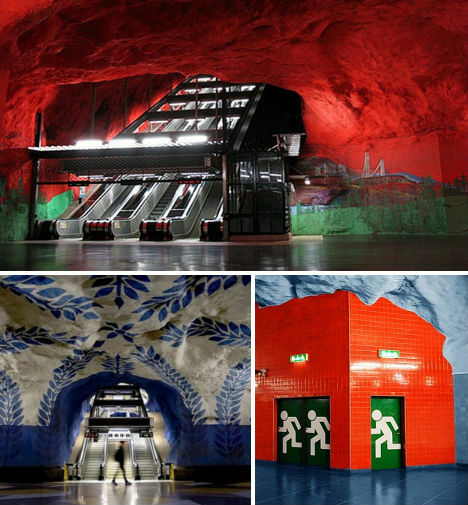 Some of the rock walls and ceilings have been painted with murals, and all 100 stations feature artwork by 140 artists. 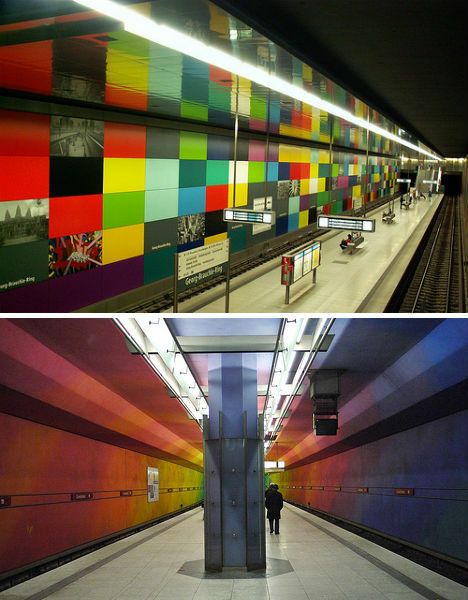 The U-Bahn in Munich is known for its colorful personality, with rainbow hues painted in many of the tunnels and terminals or applied to the walls as tiles. First built in 1972, the Munich subway system has grown to nearly one hundred stations throughout the city, many of which are designed to modern standards with spacious aisles and decorative lighting. 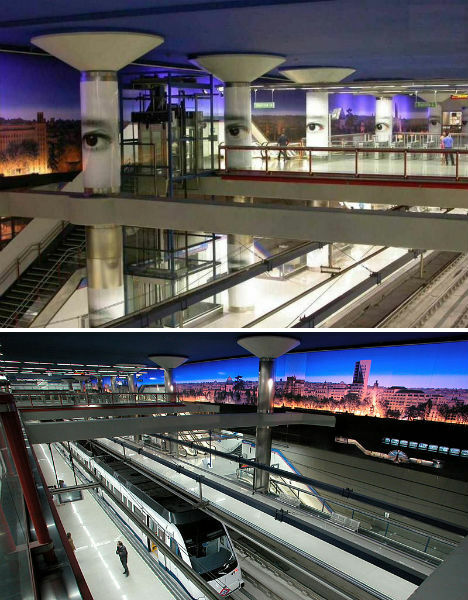 The Madrid Metro is mostly notable for two things: massive murals of the city’s skyline that make riders feel as if they’re at an above-ground station, and the giant eyes that stare down ominously from the pillars. Especially paired with a name like ‘Nuevos Ministerios’ (New Ministries), the station has a vaguely dystopian feel. 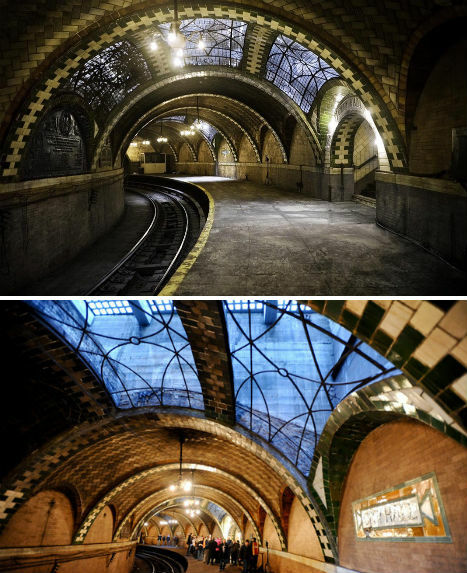 Passengers willing to take the 6 train all the way past what used to be the last stop in Brooklyn can now get a special treat: a glimpse of the stunning, long-abandoned City Hall station, which has been closed to the public since it shut down in 1945. The train passes through this station on its way back uptown, and while riders used to be forced off at the Brooklyn Bridge stop, they’re currently allowed to stay on. 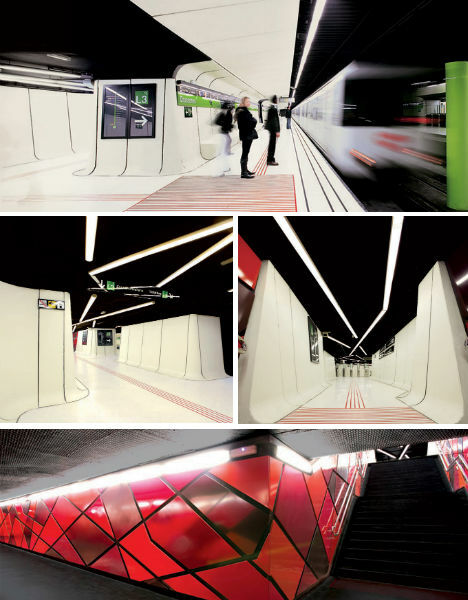 Designed by esteemed architecture firm Foster + Partners, the Bilbao Metro is is ultramodern yet vaguely organic with glassy, tubular station entrances at street level and lots of steel in the underground stations. 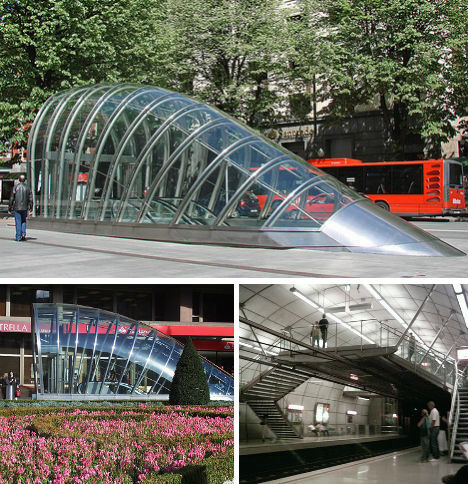 Known as ‘Fosteritos’, the glass station entrances have already become an iconic part of the city’s architecture. 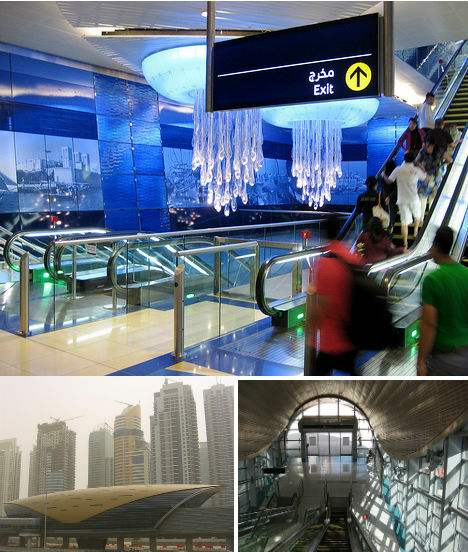 Dubai’s 47 railway stations were designed by Aedas of Birmingham to combine both traditional and modern architectural elements. “Their uniquely shell shaped roof, while modern, invokes the heritage of pearl diving – this ancient craft that requires skill and bravery brought early prosperity and is an integral part of Dubai’s history,” says Engineer Abdul Majid Al Khaja, CEO of the Rail Agency at the Dubai Roads and Transport Authority. 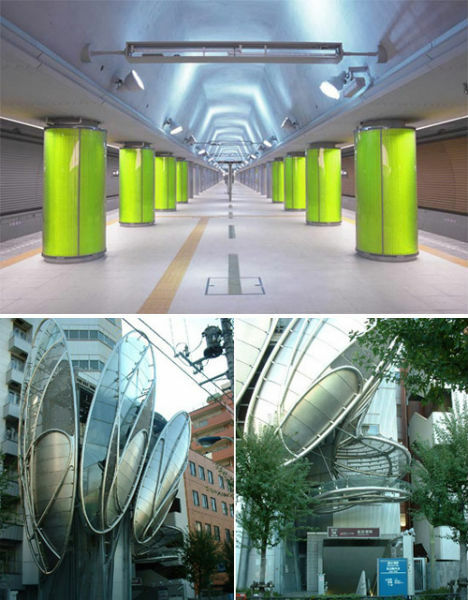 Completed in 2000, Tokyo’s Iidabashi station is bright, open and modern with pops of bright green in the form of pillars and a metal web which architect Makoto Watanabe imagines as “interweaving, entangling, expanding, pulsating.” The outside of the station, at street level, features swirling, organically shaped metal and glass designs. Daniel Libeskind’s addition to the Royal Ontario Museum in Toronto is quite a dazzling sight, so why have an ordinary subway stop just below it? The station was redesigned by Diamond & Schmitt Architects to include columns inspired by artifacts found within the museum. The five column designs represent Canada’s First Nations, Ancient Egypt, Mexico’s Toltec culture, Ancient Chinese culture and Ancient Greece. 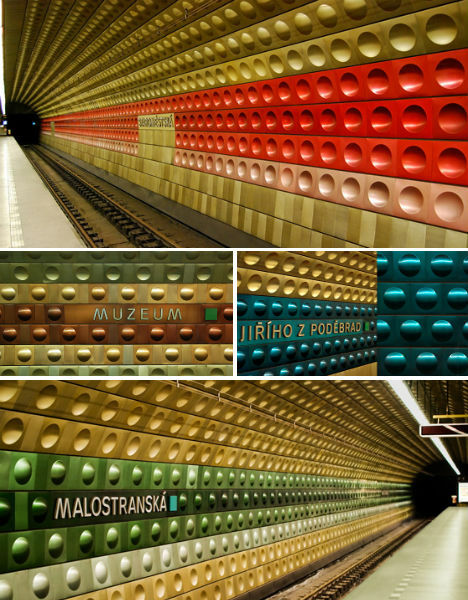 The tunnels of Prague’s Line A are covered in a colorful patchwork of metallic tiles in flat, convex and concave shapes in hues of gold, silver, green, blue and red; the color scheme differs by station. 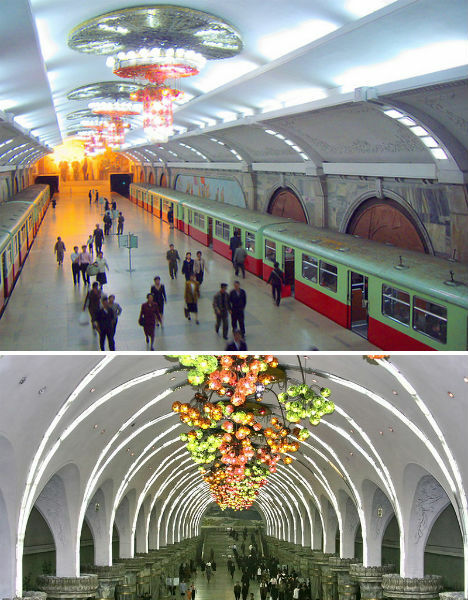 Would you expect one of the world’s most beautiful subway systems to be located in… North Korea? The deepest metro in the world at 360 feet below surface level, the Pyongyang metro network is full of colorful murals of propaganda. Thanks to its depth, the system doubles as an emergency nuclear bunker, and could keep many of the city’s citizens safe in the event of nuclear war. 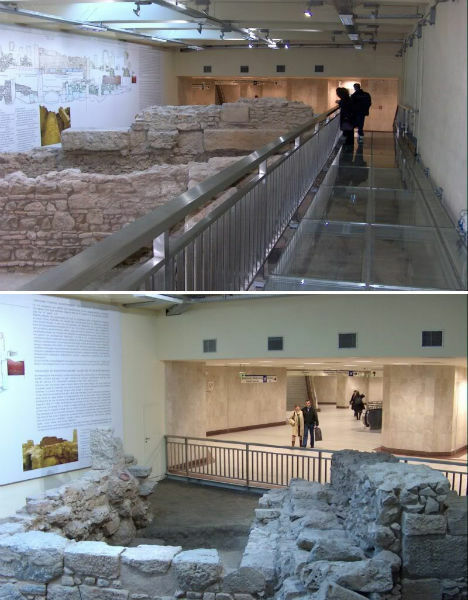 In a city as ancient as Athens, it’s easy to imagine coming upon one important archaeological discovery after another if you dig far enough – and that’s exactly what happened when excavators were working on the city’s metro system. The ancient Iridanos River, long lost, was one of those discoveries, found still flowing right where engineers had planned a subway platform. So, this section of the river – still bearing the vaulted construction completed sometime around 200 C.E. 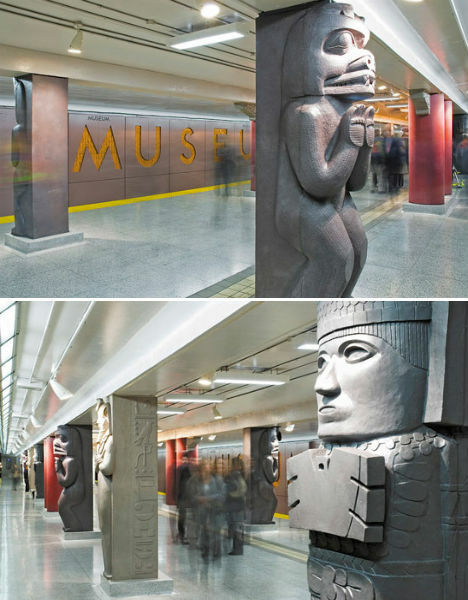 – has now become an archaeological display, the largest in any metro station. Visitors to the green line station platform can walk over the exposed river on a glass walkway. Sure, the Bund Sightseeing Tunnel in Shanghai is a rather cheesy tourist attraction, with what has been described by a Lonely Planet reviewer as “A slow-moving tram, through a comically low-tech tunnel of antiquated 80′s era rope lights, lasers and car dealership ilk inflatables — narrated only by a psychotic stream of random words”. 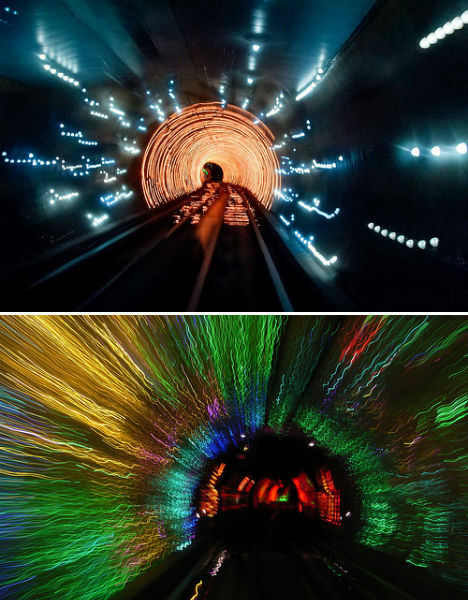 However true that may be, the pictures are still pretty cool to look at, and the tunnel is definitely among the world’s quirkiest and most unusual.